Thank you to everyone who commented to win in our last giveaway before Craft Day! Our lucky winners need a round of applause. Cheryl Crites, you won the Christmas Easel Card Kit, JeanB, you won the Nativity Dies, Bonnie Ketterman, you won the Ornament Dies and Eva Maggio, you won the Empress! We will be sending you each an email with further information. Tonight (at midnight EST) is the night! Time flies and it’s time for another exciting Craft Day! During this visit, we will be bringing you the best of the best in both Christmas and every day crafting! Join us at midnight, 8am, 11am, 3pm and 7pm for full hours of Anna Griffin Elegant Papercrafting. We will also be live streaming Midnight and the 8am hours on our Facebook page, so you can tune in there also! It’s going to be all Anna all day with additional appearances throughout the day at 9am, 12pm, 2pm, 4pm, 8pm and 10pm. Because we have so many exciting things coming for October 9th, we have a live shopping list for you! Let’s recap all of the new items that we are bringing your way so that you can build the perfect shopping list for your crafting needs! We will see you at midnight, friends! Oh Anna, can you purchase the magnetic plate for the Cuttlebug on HSN. I find that I am needing this more and more as sometimes they move even using washi tape to hold them down. Like so many of your followers, I was glued to HSN for the entire craft day because I did not want to miss a thing! Your products are high quality and beautifully designed. I ordered all (yes all) your new dies and the Empress as well. Too bad I ordered the other well known die cutter just a coupole of months ago because I had given up on you making your own machine. I should have known you would come through. But that’s ok as I will use your machine for all my AG dies which is the majority of the dies I own and use the other machine for my other dies from other designers. What really surprised me is that I received my Empress today along with the jacket card dies! Imagine within 24-36 hours after ordering the Empress it was delivered!! Will spend all tomorrow designing cards using the “Empress to Express” my joy in paper crafting. Just waiting for the rest of the items I ordered so I can make those jacket cards. My family and friends are looking forward to receiving their annual gift of greeting cards! Thank you for your wonderful designs! Can’t wait (and really can’t afford) your next crafting presentations on HSN; but still looking forward to seeing any new items you come up with! I find it odd that the binders sold out before they were listed on HSN. I asked twice about them and was told that they were saving them for later. I watched for them all day on air and online. If you are going to offer something I would hope you would make more than a handful knowing how popular they are going to be. The Empress came at a time when my other electronic cutter had a jam and I may have done something to the innards of it when it was finally able to be removed. It still works but makes a noise. Even though funds are limited I had to get it for as so many of your customers who are in the older age range, I have a lot of arthritis and have had several hand surgeries. I know that products keep getting upgrades and improvements. I know with the Cricut machines it seems one day the latest and greatest will be demoed then a month later an upgrade becomes available. I hope that this machine will not become obsolete by the time I unpack it! I bought the Minc machine and you have not had new die cuts to run through it in ages. I love that little machine! I still use cartridges in my legacy Cricut. I don’t have a tablet or a lap top and have no room near my desktop to have an updated version. And now the company no longer makes cartridges, a big disappointment. But I find I use my dies more anyway. Just realize not everyone can spare the money for constant upgrades and need products that support what we already own. I no longer go to the local big box craft stores and only purchase your products. Thank you. Good morning! Oh I got sooo carried away. I have wrist issues and had to order theEmpress! Oh those other things I ordered was me getting carried away!! I am new at card making / paper crafts and cannot wait. Good Morning Anna! So enjoyed watching you yesterday on HSN. Can’t wait to receive my Empress along with a plethora of other items! I seem to have graduated from “Griffinite” to “Annaholic”! I am so excited to be attending Create this year, my first time!! I couldn’t find the Christmas Die Binder anywhere. All I could find were the regular ones. Did they sell out before this morning? I am watching you right now and I love everything! I noticed you have mini embezzlement for Christmas, can you give us mini’s for the all occasions card kits. That would be great. When there is 24 hour craft show I stay home so I can watch all day. My friends love the cards I make for them , one friend put it in a frame , I am so proud of that. I really want an Empress! But I love all your products. I’ve been watching you on HSN today. I love the demonstrations! I have been watching the empress all day. Would truly love one so I can make beautiful things for my family. But alas just can’t afford it right now. But keep up the good work Anna! Watching you on HSN as we speak! With credit card in hand, I’ve made a number of purchases today and can’t wait to get my package! Love HSN Craft Day!! Hey Anna…enjoying you on HSN today! I ordered your jacket dies, jacket inserts, nativity dies, and Xmas easel cards auto ship last night. I was afraid they would sellout. Today I’m ordering more items…I just can’t decide yet! I had already ordered all your metallic & plaid papers, dies, Xmas die cuts & stickers, etc last month. Now it’s time to get started on those cards. Can’t wait to play with my new goodies. I also love the royal blue dress on you today! I need a loan to pay for everything I have ordered-the empress, the plates to go with it , card making kits-but all that you are showing besides what’s listed, I would love to have. Thank you most of all for the empress! Always, always, thanks for the list. Made ordering online so easy; done by fifteen minutes before midnight, thanks to HSN putting up all items on the end of Oct. 8th. Everything Empress, Jacket Dies, Easel Cards, Christmas Dies, and more coming my way. Auto-ship will keep the joy coming. Love it all. The Empress is reviving my excitement. Mary on Skype, you rock! You made amazing cards with all your goodies. Loved it with Anna and Lynne oooing and aching. HSN and Griffinites bringing the power of Anna to all of us. Ordered the Empress. Can’t wait to get it !! I have placed orders for several items, but am disappointed about a couple of things. First, I was not able to print the shopping list. It did make shopping a bit more complicated. Second, I had the Christmas orders in my cart at Midnight, but suddenly they showed sold out. I hope they do become available later. As always, such beautiful items! Anna, WOW!! Good luck today! Bought some items, which I couldn’t resist…but that’s the story of my life! I am watching every show today. Wow! I have already ordered the Empress-bundle auto ship, and now Anna is Empress Anna, the extra large plates and the Treasury Stamps and Dies. I just want it all. Have more to see. Thank you. I am getting so much,, at 73, retired, I might have to,go into business for Anna cards. I remember spent again. Just to beautiful to resist. Would you please make a shiny and matte bundle with a collection of colors. I could only find you had to buy one color at a time. Thanks. We need this product available all the time. I love it all! I would love to have the empress!!! I will be gone most of the day, but will turn TV on as soon as I’m home. Really wanted to be here. I ordered the 3 die sets that I wanted as soon as they were posted on HSN. I found out that I might not be able to watch the craft event as I had hoped. Thanks for the fun of possibly winning one as well. 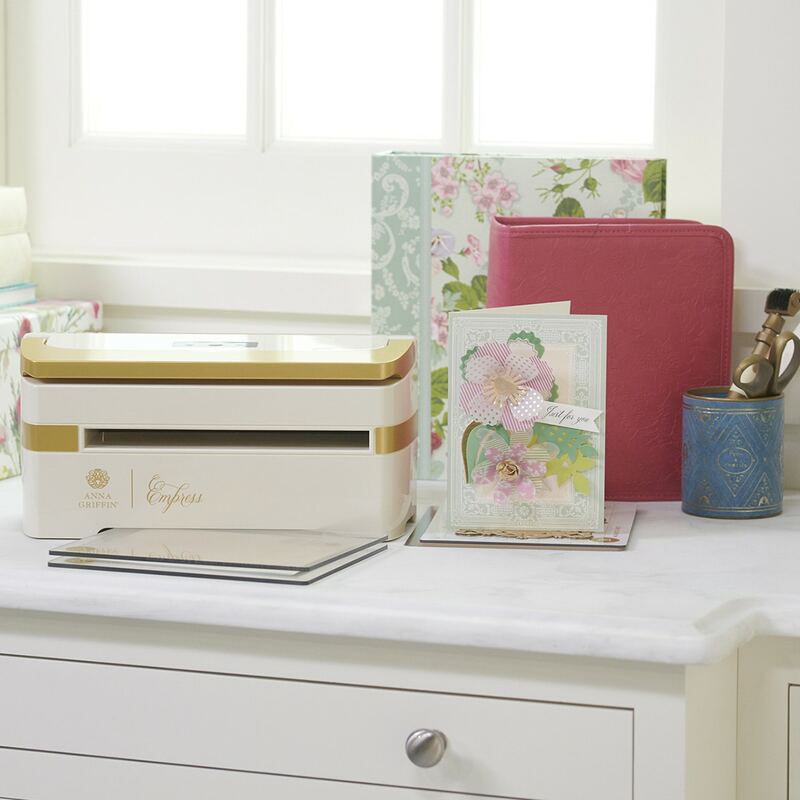 Anna, thanks so much for the new Empress die cutting machine that I recently won! I received notice that it will be delivered today, and I can’t wait to unpack it and get busy crafting! As soon as I hear the truck coming, I’ll be waiting at the door for the delivery guy. This is like getting my Christmas present early, Anna! I really appreciate this! The Empress will definitely be put to good use at my house! I’ve loved all the demos on HSN! Thanks again, and happy crafting day to everyone! I Love All the Great products you bring to the public, WELL DONE, & GOD BLESS YOU. And also the Nativity dies which are near dear to my Heart. 😍Thank you Anna Griffin from the bottom of my heart !! God Bless you!! I am so happy to have purchased the new Empress as well as the Nativity Dies and so much more! Thank you very much! I am so Happy! Thank you for this wonderful shopping list….I’m ordering the new Empress machine along with the large cutting plates. Looking forward to using all my Anna Griffin dies and folders in the new machine that I have been buying over the last few years….with NO MORE CRANKING and hopefully faster crafting. Love making my Christmas cards using your wonderful dies. I already have 2 things on order and you are not even on yet! Can’t wait to get them in the mail. Love all your things. Especially glad you include our Kitty children. I so want it ALL!!!!!! So excited my patience is running out. EMPRESS is coming and I am ready. So exciting! Can’t wait! As I write this it’s only 1 1/2 hours till I see you on TV Anna! Love everything can not wait until Tuesday! I love the new items. Please Anna bring back the Angels. Oh Anna, I can hardly wait. I’m getting ready to take my bath and get ready for bed so I can watch your program at 12:00 p.m. Happy happy time. Congratulations to all of the winners! Looking forward to shopping tonight….and tomorrow! OH my! I just ordered the Empress and can hardly wait to get it!!!! I will finally have a machine that will do justice for all of Anna’s beautiful dies!!! Also orded the large plates and auto ship jacket card dies! Will start making my Christmas gifts and cards as soon as I get my shipment. Thank you Anna for all your beautiful and quality products. I am out of space in my craft room!!!! Did you tell us about a Christmas Treasury binder a while back? Will that be shown on craft day? If so, what is the item #. I don’t remember seeing this on the craft list above. I love my other Treasury binder and would like this one, too. I cannot wait until midnight!!!!!! I am so anxious to see everything !!!!!!! I’ve got my list, and some things already saved on my order. I’m so excited can’t hardly wait till midnight..
My list is made. Just waiting for midnight EST. EMPRESS!!! It’s all I can think about. My cart is filled and waiting to add the majestic Empress! All of the other codes are ready, Woo Hoo!! I am going to work on Halloween and fall cards while I am watching. A crafting party. See you soon dear Anna. Congrats to all. I will be looking forward to another one of your great shows. Your dies and cards are awesome!!! Oh, Anna, thank you for the wonderful shopping list. I’ve got to tell you, I had to re-watch the video to make sure I didn’t just dream about the wonderful Empress Machine. No, it wasn’t just a dream, it’s really a reality. Actually it was a dream of mine. It’s everything I love about a die cutting machine…my favorite colors and it all machines in one! Now my prayers will be truly answered if all I have to do to operate it is push a button. But I’ll wait until midnight…which is a lot to ask for an an old gal. I’ve already ordered the large plates…all I need is the Empress. Love and all the blessings God can bestow to you and yours and your wonderful team for making wishes come true. What to get??? What to get??? I want it all! Anna your products are so beautiful and great quality,you make it so hard to choose. I’ve had a tough year so I think I will treat myself this craft day!!!!!! Thanks for all you do and for being you. Thank Anna for all these amazing products. I think a need a second job for my craft “addiction”.. lol. Can’t wait to watch tonight. I can’t wait! Love that Impress and the nativity dies! ready set go, am happy to see all this cool stuff coming out, love the empress and nativity die sets, and christmas cards and sentiments especially. Thank you for the shopping list! And reminder of show times. Looking forward to the new Empress. Anna, I’m looking forward to your Craft Event tonight. 4 – die sets, mini stickers, Dresden’s, and 2pks of cardstock! Thank you for the preview review! My list keeps getting longer! Awaiting for the fun to begin! Congratulations to all the lucky winners! do not know how i am going to limit myself, but going to have to try…darn it. everything is sooooo wonderful. a day without sleep for sure, for you and all of us! I’m making cards with leftover from others kits to make space for all the new! Woohoo! Midnight EST is almost here! (9 pm my time!) Anna, thousands of us are so excited to see you on air with all of your new goodies! Bless you again for choosing my name for one of the Empress machines – I absolutely love it….and now I can’t wait to order the large plates for it !!! It will save sooo much time…..I highly recommend it to anyone who is “on the fence” about ordering it! It cuts so smoothly and quickly! and I believe the embossing is more detailed than ever before ! SEE YOU SOON…….just working on my shopping list now! My DVR is set and im napping all day tomorrow so I can be there for all the action. Can’t wait. Congrats to all the winners. Wish I was one but what great items to win. I will definitely be watching starting tonight and all day tomorrow! I don’t sleep when you are having your “Crafts On”! That is my time! Love those Nativity cut and emboss dies, can’t wait! There goes my credit card again! Waiting for midnight! All day tomorrow is reserved for watching Anna’s shows. It will be a fun day. I can’t believe that I was chosen to receive the Nativity Dies!! I have tears in my eyes it is so special! Can hardly wait to see you tomorrow! Thank you so much for such a special gift. I appreciate you & your generosity to all of us!!! You are a total blessing & we dearly love you!! Anna thank you for saying the weight of the Empress. I’m hoping I can buy one. My son can get it out of the box and set it up for me. It seems like the day has been dragging but all fun will soon be here. Hope you can get some rest before the big showdown. Thank you and God Bless you. QUESTION: I keep looking on HSN for your plaid Christmas card stock since the first time they were shown, may have been in July? I bought in July and August but didn’t have enough money/credit to purchase some other items, which included the plaid papers. Will you bring them back sometime before Christmas? After? I really want to purchase them. Looking forward to HSN tonight! Thank you. SUCH HAPPINESS WHEN I SEE YOU. WILL ENJOY YOUR SHOWS WHICH GIVE ME NEW THINGS AND NEW IDEAS. SEE YOU SOON. BEST WISHES,BONNIE W.
I can’t wait for the shows to start I plan to stay up late. Can’t wait…I love to watch all your new things. This is gonna be awesome. Will have to stop and see all your lovely cards and inspiration! Can’t wait! My biggest Delma is how do I purchase everything I want, and stay within my budget? Oh well…. Took my nap and going out for snack food, I am ready for midnight. I love the Empress and the larger format card dies!!! There is so much this time it’s hard to decide what projects I want to tackle!!! Excited to see the new Empress!! I love it all & am looking forward to watching you on TV & Facebook. I would also love to win something of yours sometime. Already have my list made and you know my pocket book feels very light. Hi Anna Im a super fan of your products, I always try to buy the items in gold because of you haha, Thank you for everything, I hope to be one of the lucky winner soon, Thank you for all the wonderful creations. Love it all! Congrats to the winners! I think you should make a die cutter for the honeycomb ornaments. That would be fantastic! Wish you had a printable shopping list, with a link we could click on to download it. you can print the list off from you computer. just select to print only the pages that has the shopping list. ( on my computer it was page 2,3,4,5). ( selected to print double sided & it was only two pages). AWESOME recap, Anna, – you did that with supreme elegance! 😀 ANd have me so excited I am flushing pink again! I will see YOU at 9 pm tonight! That is only 9 hours from now! 😀 (squealing with delight!) Hugs, and Break a nail! I’ll be there, can’t wait !!! Thanks for emphasizing the Empress Dimensions. It will help me shop fast before all this fabulousness sells out. I am so excited for the shows. Thanks for all the giveaways! Setting my DVR to catch all of your hour-long demonstrations! So inspiring and fun!! Wonderful and awesome products. Cant wait to watch. I always take off the day from work to watch you all day long. Yeah normally I don’t get to see these until after work and the comments are already turned off. Thanks for the chance to win. Love AG crafting tools. Hood to catch some get AG deals on HSN craft day. Can’t wait until midnight to see that Empress! I also love watching you demonstrate the products and get lots of inspiration so I am like many others that DVR your hours so I can replay them later. See you tonite on HSN! Thanks, Anna! Love having a shopping list for your shows! Must share a suggestion that I love it even more when they are separated into New Items and Returning Favorites. I end up buying double when it’s all one one list. You know what that means? I am an avid Anna shopper and own most of your creations! I will be tuning in at midnight, can’t wait to see you present these beautiful items. Excited don’t describe my emotions. It is a lot more than that. Thank You easy pay! I am so excited! Can’t wait until I can order my Empress! Love all you do for us Anna! You make crafting so much fun and I love you for It! Bravo Anna! Your products are well thought out & the end result is always magnificent!! I want it all and will stay up to see your show at midnight! This is going to be your best show, ever!!! Thank you for info upfront. Marking my wish list now. Yesterday made 10 Halloween cards using my Anna collection plan to make more tomorrow. I send out 25 Halloween cards. Thank you for all these products. Rest up for tomorrow and enjoy your many cups of tea. I’ll be watching when I can. I love all of Annas things.I always break the bank.Anna keeps getting beyyer and beyyer.I love all her stuff. I am new to your items. I just love them all! I have purchased several items. My next purchase is going to buy the Empress can’t wait. Making my snacks now! Getting ready! I even have my wine chilling!!!! So, SO excited, Anna! I have been anxiously awaiting this event as I do every time you are at HSN. I feel so inspired just watching and I appreciate the demonstrations and examples you show us. Thank you so much for all your hard work…that of your staff as well! Best of wishes for a GREAT show on October 9th! How exciting to introduce the Empress to the world. Also so glad the show will be all day. I hope you get a TV show someday so you can share your knowledge of paper crafting each day. Paper is the best medium for everyone to experience being an artist anywhere any time. Wishing you the best of Co-host shows, Anna.. We are so anticipating the New Empress.. So Much to see! Can’t wait to see it all tonight and tomorrow! I have to be very selective , on a very tight budget, but hoping to pick up a few things and enjoy watching all day, thanks Anna, for all the inspiration! So looking forward to midnight and all day tomorrow! Thank you for sending out the list so early! Wow, I have so many items marked! Can’t wait to see the demos on the Empress machine! Thank you Anna! Thank you for the shopping list Anna! Cant wait to see ya on HSN! Have a wonderful trip and flight! Happy Scrapping! All set to watch and buy! See you soon. Can’t wait…have already ordered a few things today. The show will be the hit of our before Christmas shopping and crafting and gift giving so when the holidays arrive we will have time to relax and enjoy the holiday as we’ve already received our new products and made our cards and wrapped some that were gifts. 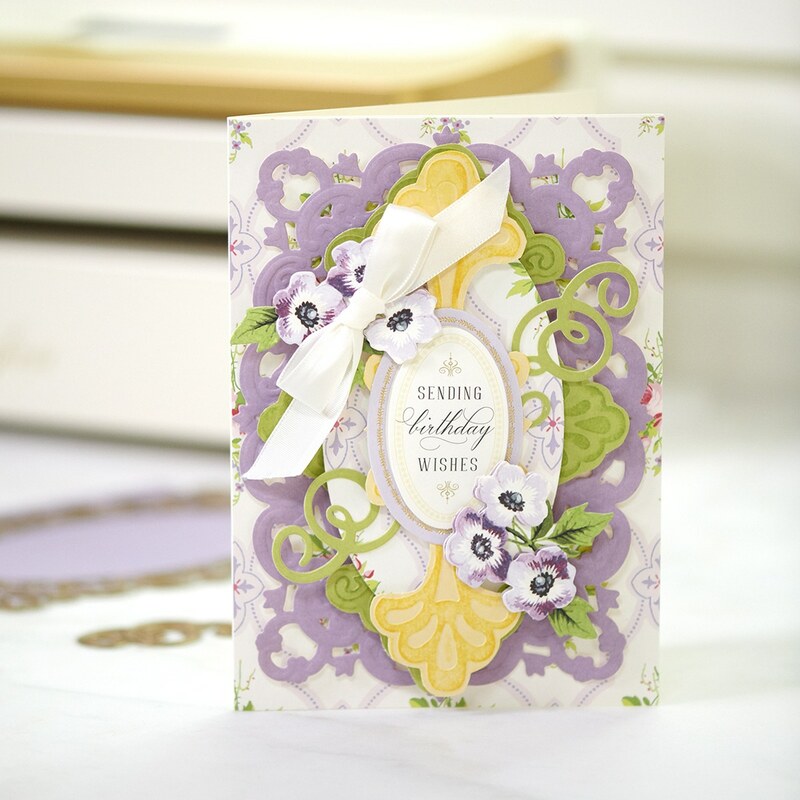 I’m so looking forward to the auto ship Easel Card Kits which are so fast to make and oh so stunning to look at. My nativity dies will soon arrive and can’t wait to use them immediately! Thanks for such great products! Thank you for the shopping list! Can’t wait to see all of the presentations on HSN craft day! I’ll be watching, buying and recording!! Congrats to the winners! Looking forward to the shows tomorrow! This shopping list is very helpful and timesaving. Looking so forward to tomorrow!! That does it, I’m going to have to move my hair appointment so that I can stay glued to the telly to watch All Anna TV! Would love to win the new Empress! Can’t wait! So excited about Empress machine. Hope my Cuttlebug 12×6 plates & dies work with it. See you there. A million thanks. I can’t wait until tomorrow to order so many things. Please! Let us know which items are NEW on these shopping lists ! I have a look much Anna Griffin I don’t know what I do and don’t have. Looks fantastic….. see you at midnight! I’m so excited for Tuesday! You are amazing! Thank you soo much for the chance to win! I just love EVERYTHING and want it ALL Anna! You are amazing. I have ordered some on my favorite things will order more later today or tomorrow. Thank you for the shopping list. It really makes things easier. CNt wait to see the shows! Good luck, Anna. Safe travels! So excited about tonight! Have a really big wish list! Already ordered so many things. Would not let me have access to the Christmas Easel Card making kit. So afraid I’ll miss getting it. Anna, I just placed my order for the October 9th show. I am so disappointed that the 625955 Christmas Easel Card Kit & Auto Ship is not available. How can this be….the show hasn’t aired yet. Please let me know what happened. All set and ready . My shopping list keeps getting longer. I can’t wait to see everything presented! Oh my gosh, I want it all! Everything is amazing! I know nothing………but I think Anna said not to use the Cuttlebug plates, something about the thickness being different. Looking forward to the program . Love seeing all of the beautiful cards and papers. I can’t wait until tomorrow! My list is made and my credit card is in hand. Love, love, love all the Christmas things. Congratulations to all the lucky winners!!! This will be a fun show! Our poor Anna will be working like crazy for us! We do appreciate it! Making my list and checking it twice! Can’t wait!!! Such Beautiful products!!!!!! Sooooooooo many decisions to make!!! LOL!! Wish I could have it all but alas! 😉 It will be great watching all of your shows to see all of the Beautiful in the Making cards and ornaments and scrapbook pages and so many other items you and your team put together. Have a great day!!!!!!!!! I can’t wait to see everything on HSN, my wish list is a mile long. I love your products Anna! Thank you so much! Can’t wait for tomorrow!! Terrific shopping list!! Yay!! Looking forward to seeing the Empress in craft action. Congrats to the winners! Some of my products are arriving this week! I get to play after I teach a beginner’s card class at our local library on Wednesday. Can’t wait! will be watching all day. So excited for tomorrow’s shows! Longest shopping list ever! Have a great day, Anna! woo hoo can’t wait for the empress demo! I am sooooo excited about tomorrow’s craft day…my daughter and I will be glued to HSN the whole time. Anna…you never disappoint! Looking forward to seeing all your beautiful creations and getting one of each! Hope my tv will be working as I will be in the middle of a hurricane! 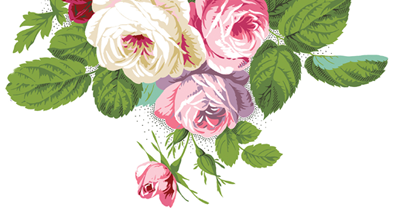 Love your products cannot wait to see the Empress! This must be your biggest list yet. Wowsie. What a day the 9th will be. I’ll be there at midnight tonight, Anna. Can’t wait to see that Empress live. Rest up – hope the “green room” at HSN is stocked with lots of coffee, tea, coke, Red Bull, etc. – you are going to need lots of energy to get through all of those presentations! Safe travels! Knock ’em dead! Congratulations to all the winners. Thanks for the list. Everyone be safe with the storm coming. So looking forward to craft day! I now care for our first grandchild while mommy and daddy work. Hopefully he naps during your presentations, lol! We are having a rainy spell here in Wisconsin so what a good time to watch Anna on Craft Day tomorrow! Fine tuning my list and ready to go! Thank you, Anna, for all you do! Tomorrow will be such an enjoyable day! Can’t wait – thank you for all the previews Anna! I want everything. Can’t wait. Thanks for the list. Can’t wait to watch HSN at midnight. Anna, are you going to bring back the easel dies for your new set? So anxious to watch your airings tomorrow on HSN. Don’t even know where to start, but do like the 3D Paper Ornaments. Can’t wait for the show, and all the goodies. Oh I can hardly wait! I’m going to be adding to my cart today in anticipation! I LOVE WATCHING YOU PRESENT YOUR BEAUTIFUL CRAFT SUPPLIES! Can’t print the list yet, but I’m ready! So excited to see all the demos and tips for all the new items! Get your nap today, Anna!!!!! And looking forward to watching Anna soon!!!! Congratulations to Product Preview #7’s winners! Anna and team, thank you for the shopping list and product recap! I am ready to shop! See you at midnight! Congratulations to all of the winners throughout these previews. 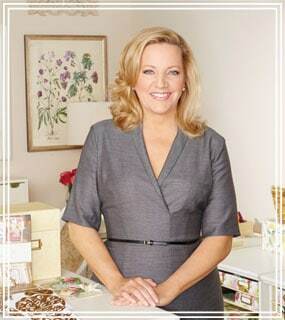 Best wishes to Anna for a fun filled day on HSN! This is so exciting! I simply love everything! I can’t wait to watch. I can’t wait for this show! So many beautiful things! Your Christmas items are gorgeous. I love the dies. I forgot how many items I want. Need to do some figuring to get everything I must have. Hubby is in trouble. Lol. I can’t wait for midnight! Definitely would like to buy an Empress! Just made some of your window cards, love them! Have a great day of shows. Looking forward seeing the Empress in action. Your products are beautiful. Thank you for what you do. I’m so excited! I have let my crafting friends know to be watching tomorrow. Can’t wait until tonight! I’m Sooooo excited! I want ALL the new goodies, especially the Empress! I always look forward to Craft Day at HSN, it really and truly is fun and exciting to shop with my fellow Anna Griffin fans and enjoy your wonderful presentations! You make the whole day seem like a get-together with us all. Thank you. Is there a way to print the shopping list? I am not getting any response to be able to print. Cant wait for midnight!!! So many wonderful products. Shopping list is super helpful. I know these craft days are long hours for you. Just know we appreciate you and are so very thankful. O my I am so excited and can’t wait for this stuff to launch. Sweet. TY Anna. Such an exciting and anticipation for tomorrow to come and all these fantastic goodies! I can’t wait to see the Empress in action…love the demos you do. Tis the season!!! Love your Christmas items every year! just now gave Hubby the heads up..tomorrow do not bother me!! I”m so excited! got Nativity Dies, Bauble Dies, Christmas Quilling card kit, Christmas Layered scenes kit. Waiting for easel card auto-ship and jacket dies and inserts. Thanks Anna you make everything so special. See you tonite! Yay! Finally we get to order the Empress in less than 10 hours! I didn’t realize there is also going to be an auto-ship for folders and dies with the Empress. It just keeps getting better and better, eeek! Thank you Anna! I hope you got lots of rest this weekend because you are going to be a busy bee! I know it’ll be a long and hard day for you on 10/9 on HSN, but I’m selfish, and wish you were on every day! By the way, who knew HSN sold other stuff, lol. I only watch HSN when Anna is on! They should change the name to AGC (Anna Griffin Channel).